New York City Ballet's spring gala program on April 4 at the Koch Theater, while modestly celebratory, lacked the electricity generated in the company's now-annual fall fashion galas. In addition to the crowd pleasing, if super-familiar, After the Rain and Tchaikovsky Pas de Deux, the company danced Martins' Jeu de Cartes, with festive costumes but little else of interest, and the highlight of the evening—the premiere of Alexei Ratmansky's Odessa. However, his dispersed attention might be reflected in Odessa, which is handsome, passionate, and at times pops with big steps. But it surprising for its general lack of innovation and movement invention, for which Ratmansky has become reliable. It's structured around three couples: Sara Mearns/Amar Ramasar, Tiler Peck/Taylor Stanley, and Sterling Hyltin/Joaquin de Luz. The latter couple doesn't click at first; she shies away from his advances, which is a main source of narrative drama within the piece, later slapping him before they reconcile. A corps of 12 shadows the couples who trade the spotlight back and forth, providing spatial and patterned texture. Desyatnikov's music moves from bold slide trombone to tangoesque sections that provoked Ratmansky into creating some phrases of stylized tango, seemingly a rite of passage for many choreographers. Keso Dekker designed the gem-hued costumes—skater dresses for the women, slinky striped shirts for the men. Particularly in the wake of viewing Ratmansky's Russian Seasons and Namouna by NYCB in a previous week, Odessa feels slightly formulaic. There are no oddities that mark these previous works, such as a "cigarette dance" or breaking the fourth wall. The corps is somewhat smaller in Odessa, and doesn't evince the kind of organic hivemind that we've seen in other dances by him, where 24 dancers might shimmer like water or move as one. It certainly merits revisiting, but perhaps he has spoiled us with prior strokes of brilliance and unattainable expectations. New dances by Justin Peck have been gaining in anticipation with each season since he began choreographing just a few years ago. This season's contribution, which I saw on May 12, gained added importance, being just the second brand-new work next to Odessa. They were featured in a hyped series called Here/Now which features 43 dances made for NYCB since 1988, some of which haven't been seen in a long while. The Decalogue is Peck's second collaboration with indie/classical composer Sufjan Stevens, who here contributes a score for solo piano. 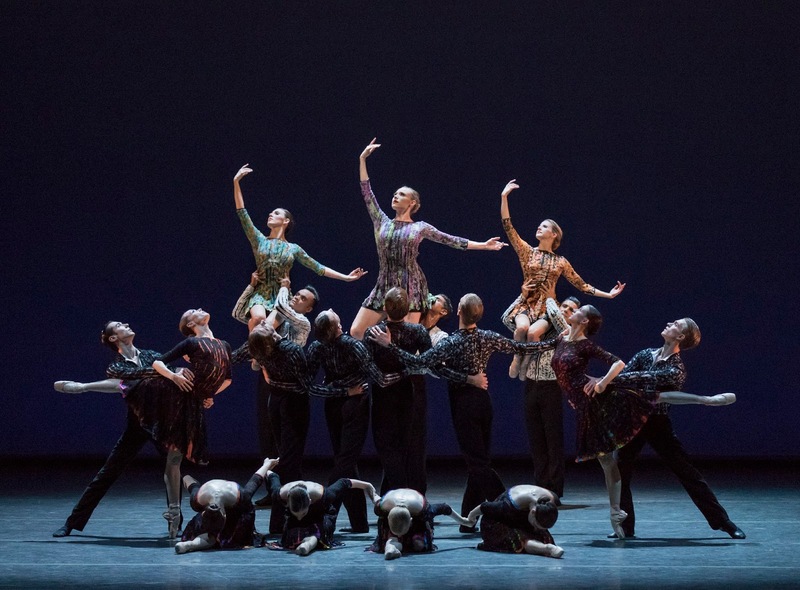 Despite fears that it might not be full enough to support a 10-part dance with 10 dancers, its expressive, impressionistic passages provide ample emotional and dynamic variety. Peck mixes long-legged company stars Sara Mearns and Teresa Reichlin with dancers from all ranks, including other capable principals who often elude the brightest spotlight, such as Jared Angle and Gonzalo Garcia. 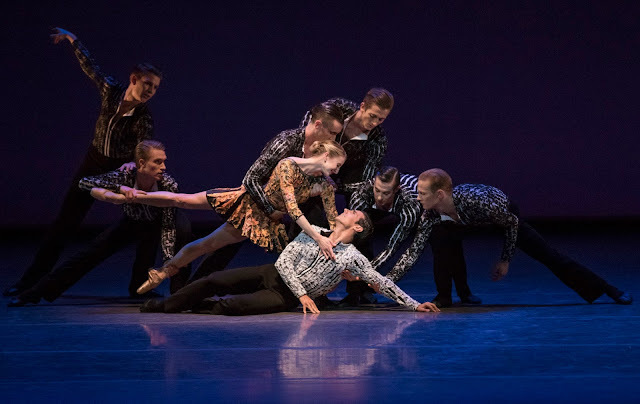 In fact, Garcia is given the full ballerina treatment—he is partnered by three and five women in different sections; they support and lift him. At other times, men are guided by other dancers in the manner in which women traditionally are. 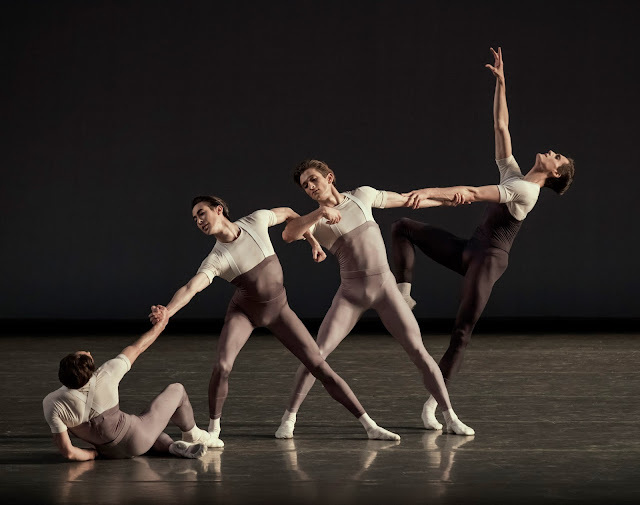 After dabbling in a heady mix of dance styles in last season's exciting premiere The Times Are Racing, Peck returns to ballet, and pointe shoes, for The Decalogue. The dancers have signature passages which are repeated in the preliminary sections, and are all tossed together in the finale. Mearns enters first, luxuriously unfurling her leg to the sky, doing a little flutter kick to punctuate a jump. In a duet, Mearns is restrained by Angle; she pulls away and seems uneasy in his embrace. Later, Rebecca Krohn moves even more slowly, extending her leg glacially as the piano notes sprinkle like raindrops. The Decalogue: Tyler Angle and Rebecca Krohn. The dancers form a rosette, then peel away, as if in bloom. Other crisp tableaux are formed —a group clusters, each dancer posing at a different level; a column of dancers curves upstage, as motion passes from one dancer to the next in a chain reaction; one couple forms an arch that passes over the snaking line. Peck finds clever twists on the conventional phrases by orienting them differently, or flipping them spatially. Stevens' score, played movingly onstage by Susan Walters, at times murmurs dreamily, courses powerfully, and skips lightly, almost like an additional character. It's clear Peck and Stevens have a strong artistic rapport. (It might have helped that it contrasted with the three works preceding it, which used early music.) Peck also designed the costumes—for the women, Balanchinean square-necked camisole leotards in subtly varying grey ombré; the men, dark unitards with pale blue yokes. That the young choreographer is also a company soloist and a talented costume designer comes as no surprise. It seems like he could do anything he sets his mind to.